November 28, 2013 Trumpet Accessories trumpet cases, trumpet gig bags	1 comment. There are various types of trumpet cases and that makes it difficult to make a choice. You will get a trumpet case when you buy the instrument and if you are buying it from a credible reseller or from a reputed brand then the trumpet case should work just fine for you at the start. When you have to shop for trumpet cases, you need to know what types are out there and what you are specifically looking for. 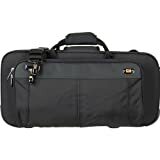 The trumpet case that comes at no additional cost with the instrument would be good for storing at home and for carrying the horn to your classes. However, it wouldn’t be good enough if you are traveling or if you need to carry several other items apart from the trumpet. At the very outset, you have to understand the differences between a hard and a soft trumpet case, as well as gig bags and storage cases. A hard trumpet case is typically made of wood or plastic. There may or may not be any leather lining or upholstery of any waterproof material. A soft case is made of materials such as leather or quality fabrics. A hard case would be much sturdier than a soft case but the latter would be much lighter than the former. One the best selling hard trumpet cases is the Gator Trumpet Case. This case sports a hard plastic (ABS) exterior with heavy-duty aluminum valance, extra strong handle, chrome-plated hardware with lockable latches, and a form-fitted EPS interior with deep plush lining. Click here to read customer reviews on Amazon and for more information. 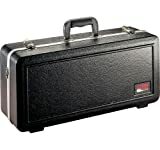 One of the best selling soft trumpet cases is the Protec Standard PRO PAC Trumpet Case. This case has a lightweight shock absorbing frame, interior mute compartment, built-in organizer to hold pens, keys, and small accessories, and a water and abrasion resistant 1680 gauge ballistic nylon exterior. It also has roomy exterior pocket and comes with a shoulder strap. Click here for more information on this case and to read customer reviews on Amazon. Gig bags are cool soft-sided trumpet cases that are stylish, colorful and may come in various designs. 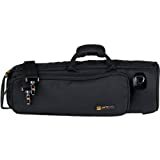 Gig bags are convenient for carrying your instrument because they are light, not too bulky and usually have a shoulder strap but they offer the least amount of protection for your trumpet. By far the most popular trumpet gig bag is the Protec Deluxe Trumpet Bag. This bag is made of 1680 gauge ballistic nylon that is water and abrasion resistant. The bag has a soft plush lining, roomy exterior pocket, and has black powder coated hardware and a shoulder strap. This bag has over forty (40) 5-star reviews on Amazon - Click Here to check it out. Bottom line is you have to decide what's important to you. A hard case would be heavier but more protective and if you are young enough then you can easily carry them around. These are definitely a good option for students. A soft case is good for those who are very careful with their handling of luggage and bags. Many senior musicians or veterans opt for soft cases since they are lighter than a hard case and they tend to be more gentle with their instruments. Gig bags are good for temporary use going to and from gigs but offer the least amount of protection. These are favored my many since they are lightweight and more hip. I wouldn't leave your trumpet unattended in a gig bag though, it could get crushed if something fell on it! If cost is a major issue I suppose you could always go the route of Mile Davis who reportedly once used a paper bag to store his trumpet en route to a gig, but I wouldn't recommend it. Lastly, you should also consider the space inside a trumpet case while shopping. Some trumpet cases can hold two or three horns at the same time while many would allow you some space to keep accessories, mouthpieces and other essentials. These are referred to as double or triple gig bags and are most often use by working musicians. I’m looking for a professional trumpet. I play alot of local events. Not for marching. More classical, opera, churces, and some stage performances. Variety of range is very important for me.